This post is part 2 in a series about social media data collection experiments conducted in Matt Kirschenbaum‘s Introduction to Digital Studies. Fred Turner’s interview with Logic Magazine1 was one of the first readings for MITH 610: Critical Topics in Digital Studies, the introductory course to digital humanities at the University of Maryland. Over the course of the semester, we were asked to complete several exercises that incorporated digital methodologies, and I decided to return to Turner’s reading for our mini data story exercise. For this exercise, we were asked to gather a Twitter data set using twarc and to develop a data story with the data we collected. My central questions were: Is engineering culture “about making the product” as Fred Turner asserts? Is it about more, or less, or something altogether different? These questions motivated me to collect CSV data filled with tweets that included “#engineering.” I am interested in how society constructs the image of engineering and how this image might influence students’ relationships to engineering, including decisions to pursue engineering as a major and interactions with the curriculum once they begin engineering coursework. My working assumption is that we each have an image of “the engineer,” an image that functions much like Alasdair MacIntyre’s “character.” MacIntyre defines character as “a very special type of social role which places a certain kind of moral constraint on the personality of those who inhabit them in a way in which many other social roles do not.”2 If #engineering is what an engineer does, then my concern is how the image of that doing constrains. While hashtags can be used to follow social justice movements, for example to “reveal a feminist activist assemblage,”3 I want to see if “#engineering” might reveal an assemblage from which I can derive adjectives to describe “the engineer.” Because I am interested in a snapshot of how engineering is depicted, I did not modify the twarc search syntax for “#engineering.” If, as one scholar has suggested, “the concept of the hashtag promises constancy and stability of the image,” then the hashtag offers some insight into the image of engineering4. I wanted a broad range of data from a diversity of users, so I started the search and let it run for several minutes before pausing it. The paused search returned 15,157 tweets sent between Friday, April 20, 2018 and Tuesday, April 24, 2018. 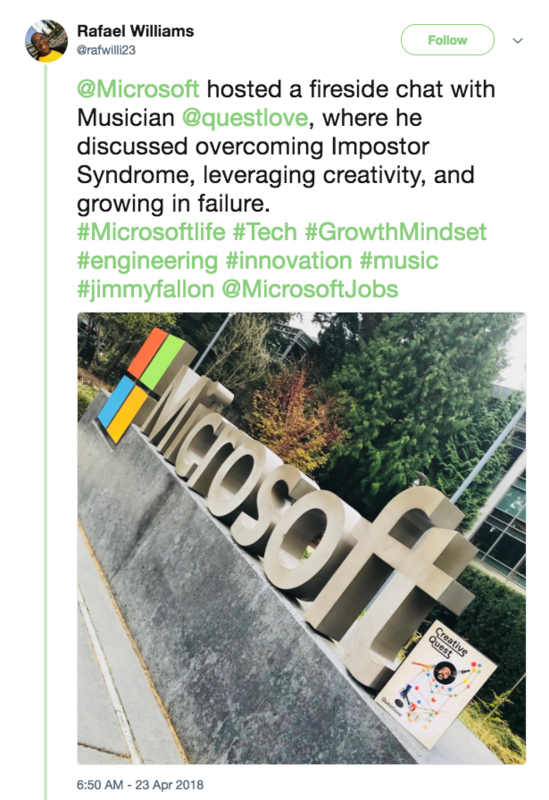 Why do people use the hashtag? What are the most popular or influential accounts and tweets using the hashtag? Who follows accounts that use the hashtag? Who RTs tweets with the hashtag and who follows them? How do people respond to tweets with the hashtag? What types of media, e.g. images and videos, accompany tweets with the hashtag? I can posit answers to some of these questions by using spreadsheets and word clouds to analyze the tweets. First, to understand why people might use the hashtag, I generated the word cloud in Fig. 1. 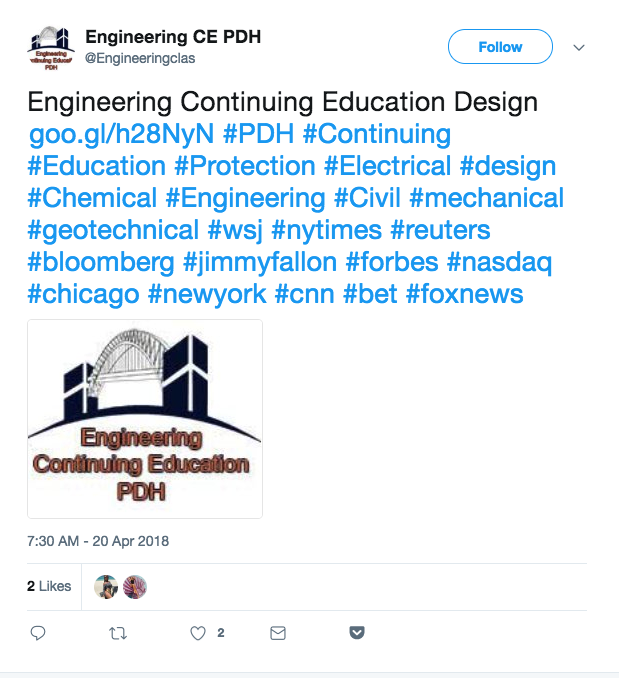 It represents other hashtags that accounts used in addition to #engineering within the same tweet. To generate the word cloud, I copied the “hashtags” column from the .csv file into a free online tool, WordClouds.com. The bigger the word appears the more often it occurred. 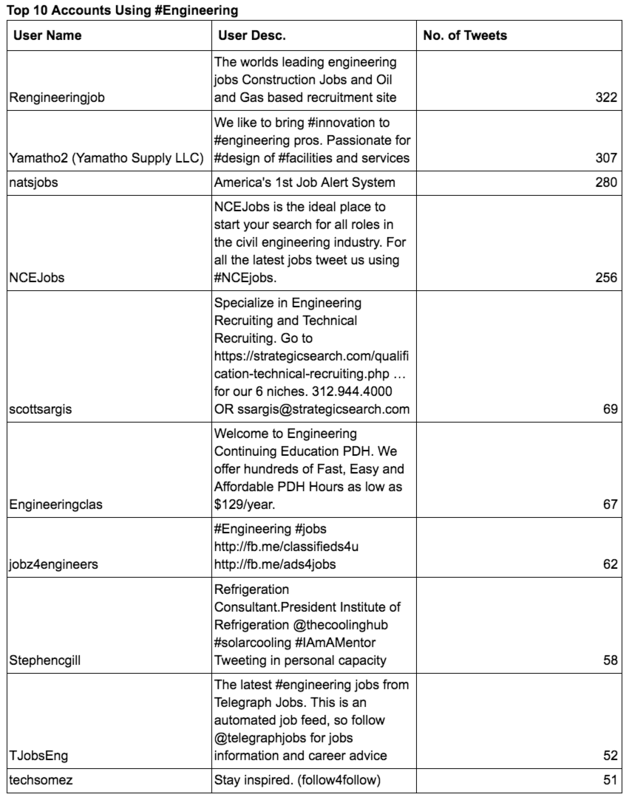 To better understand the “who,” I also used a pivot table to identify the top 10 accounts using #engineering. The results displayed in the table suggest that the hashtag is often used by accounts whose primary function is recruiting. Of course, using the hashtag does not mean that the tweet is influential. To start to identify influential tweets I decided to look at favorited tweets because retweets seemed to be more automated, for example, a circle of accounts all retweeting the same content. Below are the top 10 most favorited tweets. 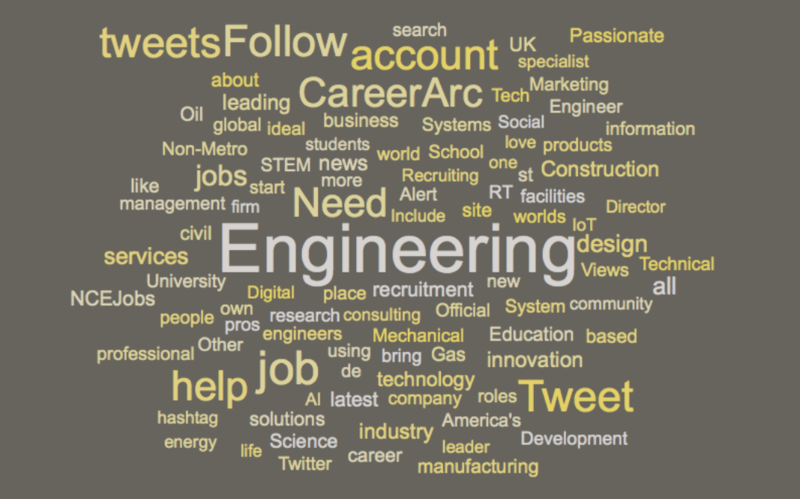 Most of the tweets express wonder at the feats of #engineering. @colin_furze, who also has a YouTube account “with all the crazy inventions and projects,” appears 3 times. He has approximately 35,800 followers. Exploring how the invocation of wonder overlaps with the more pragmatic concern of getting a job could be the focus of future analysis. 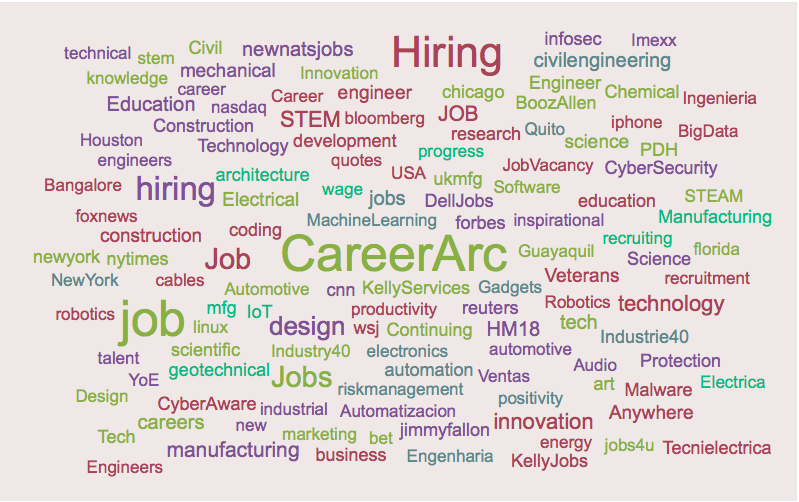 I tried to find an easy way to visualize the network/assemblage swirling about #engineering. I do not have previous experience with this, but after a few emails and discovering that NodeXL does not work on on Apple computers, I found GEPHI. I downloaded it and realized it would take a little time to learn the software and properly format my data. Reading about the software, I learned about “nodes” (in the case of Twitter, users) and “edges” (connections between users). Since my own personal discovery, I have seen two scholars present on the work they did with GEPHI, and I realize it is commonly used for visualizing social media networks. To create a clearer picture of the influence of the accounts using the hashtag, mastering GEPHI might be the best next step. However, even with GEPHI, this dataset is limited, and therefore, it may or may not represent what the public assumes about engineering and engineers. 1 Fred Turner, “Don’t Be Evil: Fred Turner on Utopias, Frontiers, and Brogrammers,” Logic Magazine, https://logicmag.io/03-dont-be-evil/. 2 Alasdair MacIntyre, After Virtue: A Study in Moral Theory (Notre Dame, Ind. : University of Notre Dame Press, 2007), 27. 3 Carrie A. Rentschler, “Bystander Intervention, Feminist Hashtag Activism, and the Anti-Carceral Politics of Care,” Feminist Media Studies 17, no. 4 (2017): 568. 4 Tara McLennan, “Hashtag “Sunset,”” The International Journal of the Image 7, no. 1 (2016): 33, doi://10.18848/2154-8560/CGP/v07i01/33-43. 5 Shirin Vossoughi, Paula K Hooper, and Meg Escudé, “Making through the Lens of Culture and Power: Toward Transformative Visions for Educational Equity,” Harvard Educational Review 86, no. 2 (2016): 207. 7 Safiya Noble, Algorithms of Oppression: How Search Engines Reinforce Racism (New York: NYU Press, 2018), Loc. 286, Kindle. 8 MacIntyre, After Virtue, 27.